I have a 2012 FX4 but it only has 18,000 miles on it. I have used it hard, towing a trailer for work most days, stop n go traffic, and multiple stops during the day. The 6 speed transmission on this vehicle is said to be solid by Ford techs I have seen on YouTube. But I would not call it smooth or sophisticated. Hopefully your situation is "normal" for this vehicle. But owning a European car now and several in the past, I can tell you that a US pickup's shifting will not seem so smooth compared to better more sophisticated cars. I tend to get a slight momentary racing while upshifting on mine, rather than your problem. One situation where transmissions will shudder on downshifts as you slow is temperature extremes. If it's very hot the fluid can thin. Or be too thick till warm if very cold. Be sure to check the transmission fluid level with the vehicle in park and warmed up as per the manual instructions to see if the level is adequate. If it is, I would consider a flush of the transmission fluid and a filter change just to make sure it's not a simple fix. If you still feel it's not right, try another Ford dealer. If the problem continues and they claim it's normal I would seek a second opinion at a quality independent transmission shop, not a Ford dealer. They have no incentive to turn you away and can/should provide a written diagnosis of the potential issues and their opinion based on experience with this popular vehicle type as to if it's "normal" or not. That will go a long way towards getting Ford's attention. Shouldn't cost too much for a quick test drive and a hook up to an analyzer. As a last resort, one could seek out an attorney who specializes in suing car dealers. Google should help with that. Sometimes a letter from them is all it takes. Worked for my brother with a Ram that had overdrive issues early in its life. They put in a new transmission just out of warranty even paid the attorney fees! You have maybe 3 years of warranty left on the powertrain, I would not panic and sell it as you'd take quite a hit. But I would keep trying to get it right. If in the end that doesn't happen I'd probably trade it in when it has 6 months warranty left on it. Dealers are often very flippant about test drives and may not even notice if it's subtle. A Ford dealer would take it in trade no problem, as suddenly they would decide it needed a new transmission paid for by Ford! Good luck. I don't have the same model as you, but I would say the short answer is that if it happens only occassionally, you're probably OK. If it's happening regularly, something is probably not right. In my two ford vehicles (one F-150, the other not), I know the computer in the transmission can get fooled occasionally under the right circumstance, such as say shifting from reverse to drive and how I apply the throttle. For example, if I start to apply throttle but then back off, the engine RPMs might drop too low briefly, giving a slight "bucking" sensation you describe. But, under normal conditions, it shifts well enough that it goes unnoticed. Even though people may have different opinions on what is smooth, it may be worth a second opinion. You may also want to give the tech a personal test drive so that you can replicate the conditions under which it happens so that you are sure they are experiencing the same thing you are describing. Thank you so much for your advice, I went to check transmission fluid but it appears to be sealed unit, could not find dip stick, will bring back to dealer, thanks again for your help. Have 2004 F150 FX4. No transmission problems in 60,000 miles. I do have a slight shudder when turning that I have been told is rear differential doing its normal job. Same thing? There is a dip stick in the trans. You have to go under on the pass. side of trans. Its a short stick. On mine a 2014 I dont have the issue but I have 8000 miles on mine. I know these trans learn how you drive and work like that. I seen it posted by others to disconnect the battery and then reconnect to retrain the truck to your driving habits. I have a 13 that i get an occasional hard down shift, its worth watching, but probably normal for a ford. The above suggestions are correct. I had Ford re-flash my transmission due to horrible downshifting. It's 100% now. In addition, there is an issue on newer F150's (a TSB) with lubrication on the transmission output shaft splines to driveshaft. I think the TSB is for 2 piece driveshafts, but the "fix" works on the one piece driveshaft too. The problem is that as the suspension moves, the driveshaft moves in and out over the trans/transfer case splines. It then starts to stick, and when it releases, it does so with a "bang" or a "thud". This can happen during deceleration (as the nose drops and the tail lifts during decel) , and it might seem to be the transmission, but it's actually the spline lube issue. My '10 shifts rather smoothly...at least by my standards. 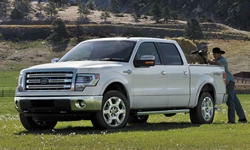 The Ford 6 speed in the F-trucks is rather burly, so I'm thinking that it's not the trans. It will FEEL like it's coming from the trans, but the driveline is a big system and everything is linked...so you'll feel an "inconsistancy" in one component but it will telegraph thru the entire driveline. I'd say that if there's a shudder when slowing down, you might want to get the rear diff checked. Sounds like excessive lash between the pinion and ring gear. Driveshaft might be out of balance as well, but I'm leaning towards the rear diff. Thank you for your responce, I'll bring this to the attention to the dealer when I bring it in.